'Twas the morning after the night before. Well, not quite morning, as I was yanked out of bed at 4am. Surely that's the middle of the night? When I got to the top of stairs I was contemplating whether it would be less painful throwing myself down - rather than walking down. I decided on the latter and stumbled down like I'd just been shot. Needless to say, my quads were a little on the tender side. Nothing to too dramatic though, just the usual aches and pains. Anyway, it was time to see if from the other side of the race and return the supporting favour. As you will probably know, I was up at this ridiculous hour (and on a bank holiday Monday!) to chase Sonic and Neal around the WHW. After spending an hour running around organising everything for Sonic, my legs had loosened up quite nicely. The chaps set off at 6am sharp. The sprint-position start was comical, but not entirely unjustified. I drove off - with enough food and gear to last a month - to meet them at Carbeth Huts. Although I'm quite familiar with the WHW, I was pretty clueless about how to reach the meeting points on the road. It was a bit a learning experience for me too. I heard the boys chitter-chatter for about half a mile before they appeared flying round the corner. They claimed to be ahead of schedule because they met another runner and "just had to put him in the ground". A mindset that probably didn't bode well for another 50 miles. 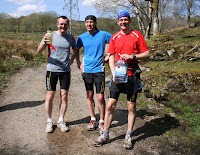 On to Beech Trees Inn, where they stopped for a snack and fluid top-up. I'd sorted everything in the boot and had a feast set up on the parcel self. I felt like Silke. But much less pleasant. I got to Drymen well before time. I was trying to be super-efficient, but managed to park in the wrong place. I didn't realise there was a small path at the opposite side to the gate. As I was standing on the road - camera at the ready - I had to scuttle back to car to race to the top when they arrived. 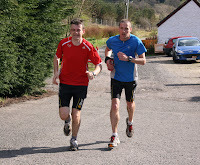 Another top-up (and bewildered discussion about Highland Fling participants times) and they were off to Balmaha. I bought some papers and sat in Balmaha carpark for an hour. The sun was coming through nicely now, so it was the perfect day to spend supporting. Plus I was super-smug that my part of the WHW trilogy was done and dusted. The guys appeared and in good spirits - which means they still had enough wit to mock me. Threats of eating their supplies soon sent them on their way. En route to Rowardenan I nearly crashed the car whilst rubber-necking to see if I could catch a sight of them. I decided to stop at Sallochy Bay to take pictures of them passing. What an experience that was. It was like a gypsy campsite. If Shameless had a camping trip. ..that would be it. Again a lay out some food supplies on the parcel shelf. It was like a mobile tuck shop. Shameless must have thought the "Tali van" (no offense to my ancestors in-law) had made a special detour. Neal arrived shortly after 10am , with a very pale-faced Sonic on tow. He was muttering and spluttering about feeling awful, which is really not like him. Not that he doesn't milk an illness, it's just that he knows it's useless trying to milk it with me ;-) After about 10 minutes they decided to push on the Rowardenan and then make decision from there on in. As Peter (Neal's father-in-law) was meeting us they, the guys had the chance to split up if need be. They trotted off and I jumped in the car to drive away, then I caught sight of Marco being held up by a tree and watering the roots with his projectile vomiting. There was a lot of fluid coming up. I was guessing that the cold coffee, banana milk and salty energy drink wasn't a good combo. You'd think, eh? Well, whatever came up did the trick as he was fine coming into Rowardenan. I felt more sick pacing up and down the carpark waiting for him to appear. The set off to take on the notorious lochside, and we set off on the long journey to really only travel a short distance. At Beinglas, a little support network had gathered. Thomas an d Silke had stopped by on their way back from St Fillins and JK and Katrina just happened to be, erm, no way near the area. JK had treated his wife to lunch at Drover's Inn and then subtly dropped in the "did I forget to mention...". I'm sure the guys were delighted to see everyone out to cheer them on. We had brought up all the stuff from the car, so they could take whatever they needed. Of course, Neal had decided he wanted to change his shoes and socks and sent me back for them. Given the state of my legs, running back to the car is probably the nicest thing I've done all year;-) They hung about for far too long. Sonic said it was because they felt guilty about shooting off so quickly. Uh hum. Likely story. Later they told me the gathering at Beinglas was the highlight of the day. Thomas joined them for a few miles. Watching three pairs of Skins compression shorts leaving the campsite was quite comical. Especially considering they're marketed as a prevention for sporting injuries...and all three of them were hobbling in pain. We met them at Derrydarroch and then again the A82 crossover - this part was all too familiar to me. I was glad I was the one taking the pictures this time. Tom made his excuses to bow out, whilst Sonic had a bonding moment with a packet of babywipes. I nearly got taken out by a truck running over the road to get said babywipes. At Auchentyre Farm, Peter and I popped in for a coffee. Actually it would be a crime to call it coffee, but I needed my caffeine fix. I was a little anxious as the guys seemed to be taking longer than expected or maybe I was just over-generous about their predicted arrival time. I walked to the end of the track to watch for them coming through the gate. And then there they were, strolling along. 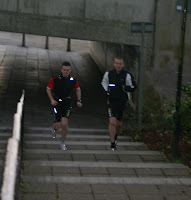 The caught sight of me with the camera and, ta da, there was a burst of enthusiastic running. Me thinks they were at it folks. To be fair, only a few miles from the end and everything had taking it's toll. I was really pleased they had stuck by each other through thick and thin. Given how competitive they both are, I thought this was a quite big. Again they tried to stop for too long, but I shooed them on. As we drove by I was hanging out the window shouting promises of beer if they finished under 11 hours. I think Peter was slightly mortified by my behaviour. Hey you got to be a runner to appreciate the motivators. Especially the one when I was standing in front of Brodies screaming "you've got four minutes" down the track. Every biker in the Green Welly carpark, must have thought: Four minutes for what? Good blog and great weather for the run. I've got used to living daawn saarrf and quite like a bit of sun for running. Given the weather and their long breaks, it was an excellent time. It does sound like Marco still needs to think about his nutrition & hydration though. One of the advantages of running self supported is that there's less inclination to "binge" at the rest stops. I'm sure that helps to reduce stomach problems. The thing about races the distance of the WHW is that sorting your nutrition & hydration is really crucial. It's no use being a stong runner if you can't find out how to fuel the machine along the way. Yeah the nutrition bit is really worrying me now. It was definitely a binge that made me sick. I was so worried about bonking again that I went the opposite. I just hope that for the big one I can find somewhere in between. Hope your okay and recovering well. Well done folks. Good running and good supporting. It was really hot and I still suffer from sunburn from that short section but it was great to meet you again. PS: The Fling starts a f t e r the underpass just at the bottom of the stairs. And it finishes b e f o r e the A82 crossing! Anyway, good recovery for all three of you and see you at the night run!